An orchestra is an instrumental ensemble, consisting of string, brass, woodwind, and percussion sections. The term orchestra derives from the Greek name for the semicircular area in front of the ancient Greek stage reserved for the chorus in theatrical presentations. In fifteenth century Europe, instrumental ensembles of small numbers were sometimes referred to as bands, and they might include as few as four or five players. The orchestra grew by accretion from 1600 to 1900, but has changed very little during the course of the twentieth century. In the history of Western musical tradition, the evolution of symphony orchestra to its modern form can be seen as an apotheosis of instrumental music. As European composers sought greater expression in their work, the orchestra became the vehicle through which they could achieve a multitude of expressive utterances due to the power and timbrel nuances of the ensemble. As the orchestra coalesced into its modern form and the technical expertise of the modern musician developed exponentially, composers were afforded the opportunity to write music in ways that composers of only a few decades earlier could never have imagined. The wonder of the symphonic tradition was articulated in a most poetic fashion by long-time program annotator of the Cleveland Orchestra, Klaus George Roy, when he wrote: "What more miraculous creation of mankind is there than the symphony orchestra—a hundred musicians collaborating flawlessly in the creation of a single sonority from moment to moment, under the guidance of a single and singular mind who conveys the sound image of another's tonal imagination, and carrying with it a single listener as it carries a thousand or two thousand? We tend to take for granted the skill and sensitivity of such a performing organism, and we should take time to marvel afresh that such a joint effort is possible for human beings, so rich in communication, beauty and meaning." It is in this communication of beauty and meaning that the symphony orchestra continues to find relevance in contemporary society. Orchestras of smaller proportions (forty players or less) are commonly known as chamber orchestras. Chamber orchestras might employ as many as fifty members if a score calls for a larger compliment of winds, brass, or percussion. This can especially be the case in music composed in the twentieth century. Chamber orchestra often work without a conductor. The modern orchestra, numbering from fifty to as many as one-hundred members or more, may be referred to as either a symphony orchestra or philharmonic orchestra. These prefixes do not necessarily indicate any strict difference in either the instrumental constitution or role of the orchestra, but are often used to distinguish different ensembles based in the same city (for instance, the London Symphony Orchestra and the London Philharmonic Orchestra). 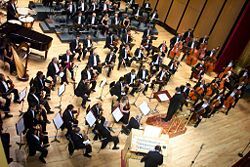 The number of musicians in a symphony orchestra may vary in a particular performance according to the work being performed or the the size of the venue. Percussion: Timpani, snare drum, bass drum, cymbals, triangle, celesta, piano, etc. Strings: Harp(s), 16 to 30 violins, 8 to 12 violas, 8 to 12 violoncellos, and 5 to 8 double basses. Occasionally, an orchestra will feature notable wind ensemble instruments, such as the euphonium, the saxophone, the alto clarinet, and the baritone horn. The so-called "standard complement" of "double winds and brass" in the orchestra from the first half of the nineteenth century is generally attributed to the forces called for by Beethoven. With the exception of his Fourth Symphony and Violin Concerto (which specify the singular Flauto), the composer's instrumentation almost always included paired flutes, oboes, clarinets, bassoons, horns, and trumpets. The expansion of this particular timbrel "palette" in Symphonies 3, 5, 6, and 9 is carefully calculated by Beethoven for an innovative effect. The third horn in the Eroica Symphony arrives to provide not only some harmonic flexibility, but also the effect of "choral" brass in the Trio. Piccolo, contrabassoon, and trombones add to the triumphal finale of his Symphony No. 5. A piccolo and a pair of trombones help deliver storm and sunshine in the Sixth. The Ninth asks for a second pair of horns, for reasons similar to the Eroica (four horns has since become standard); Beethoven's use of piccolo, contrabassoon, trombones, and unpitched percussion—plus chorus and vocal soloists—in his finale, are his earliest suggestion that the timbral boundaries of "symphony" might be expanded for good. But for several decades after his departure, symphonic instrumentation was faithful to Beethoven's well-established model, with few exceptions. Additional instruments are not considered standard but are scored occasionally. Examples of these instruments include the saxophone, flugelhorn, cornet, euphonium, glass harmonica, harpsichord, Wagner tuba, accordion, theremin, ondes martenot, mandolin, guitar, sitar, organ, and harmonium. For example, saxophones are called for in a limited range of nineteenth and twentieth century repertoire. While appearing only as featured solo instruments in some works, for example Ravel's orchestration of Mussorgsky's Pictures at an Exhibition, the saxophone is included in other works, such as Ravel's Bolero or Rachmaninoff's Symphonic Dances, as a member of the orchestral ensemble. Similarly, the euphonium is featured in a few Romantic and twentieth century works, and cornets appear in Tchaikovsky's ballet, Swan Lake, Debussy's La Mer, and several orchestral works by Hector Berlioz. Unless these instruments are played by members doubling with another instrument (for example, a trombone player changing to euphonium for a certain passage), orchestras use freelance musicians to augment their regular rosters. Between the instrument groups and within each group of instruments, there is a generally accepted hierarchy. Every instrumental group (or section) has a principal (or soloist) who is generally responsible for leading the group and playing solos. The violins are divided into two groups, first violin and second violin, and therefore have two principals. The principal first violin is called the concertmaster (or leader) and is considered the leader of not only the string section, but of the entire orchestra, subordinate only to the conductor. The principal trombone is considered the leader of the low brass section, while the principal trumpet is generally considered the leader of the entire brass section. Similarly, the principal oboe (or sometimes the principal flute) is considered the leader of the entire woodwind section. The horn, while technically a brass instrument, often acts in the role of both woodwind and brass. Most sections also have an assistant principal (or co-principal, or associate principal), or in the case of the first violins, an assistant concertmaster, who often plays a tutti part in addition to replacing the principal in his or her absence. A tutti (or section) string player plays unison with the rest of the section. Where a solo part is called for in a string section, for example in the violins, that part is invariably played by the section leader. Tutti wind and brass players generally play a unique, but non-solo, part. Section percussionists play parts assigned to them by the principal percussionist. The most frequently performed repertoire for a symphony orchestra is Western classical music or opera. However, orchestras are sometimes used in popular music, and are also used extensively in music for motion pictures. In the fifteenth and sixteenth centuries in Italy, the households of nobles had musicians to provide music for dancing and the court. However, with the emergence of the theater, particularly opera, in the early seventeenth century, music was increasingly written for groups of players in combination: which is the origin of orchestral playing. Opera originated in Italy, and Germany eagerly followed. Dresden, Munich and Hamburg successively built opera houses. At the end of the seventeenth century, opera flourished in England under Henry Purcell, and in France under Lully, who with the collaboration of Molière, also greatly raised the status of the entertainments known as ballets, interspersed with instrumental and vocal music. In the seventeenth century and early eighteenth century instrumental groups were taken from all of the available talent. A composer such as Johann Sebastian Bach had control over almost all of the musical resources of a town, whereas Handel would hire the best musicians available. This placed a premium on being able to rewrite music for whichever singers or musicians were best suited for a performance—Handel produced different versions of the Messiah oratorio almost every year. As nobility began to build retreats from towns, they began to hire standing bodies of musicians. Composers such as the young Joseph Haydn would have, then, a fixed body of instrumentalists to work with. At the same time, traveling virtuoso performers would write concerti that featured their skills, and travel from town to town, arranging concerts from whoever was there. The aristocratic orchestras worked together over long periods of time, making it possible for ensemble playing to improve over time. This change, from civic music making where the composer had some degree of time or control, to smaller court music making and one-off performance, placed a premium on music that was easy to learn, often with little or no rehearsal. The results were changes in musical style and emphasis on new techniques. Mannheim had one of the most famous orchestras of that time, where notated dynamics and phrasing, previously quite rare, became standard (called the Mannheim school). It also attended a change in musical style from the complex counterpoint of the baroque period, to an emphasis on clear melody, homophonic textures, short phrases, and frequent cadences: A style that would later be defined as classical. Throughout the late eighteenth century, composers would continue to have to assemble musicians for a performance, often called an "Academy," which would, naturally, feature their own compositions. In 1781, however, the Leipzig Gewandhaus Orchestra was organized from the merchants concert society, and it began a trend towards the formation of civic orchestras that would accelerate into the nineteenth century. In 1815, Boston's Handel and Haydn Society was founded, in 1842, the New York Philharmonic and the Vienna Philharmonic were formed, and in 1858, the Hallé Orchestra was formed in Manchester. There had long been standing bodies of musicians around operas, but not for concert music: This situation changed in the early nineteenth century as part of the increasing emphasis in the composition of symphonies and other purely instrumental forms. This was encouraged by composer critics such as E.T.A. Hoffmann, who declared that instrumental music was the "purest form" of music. The creation of standing orchestras also resulted in a professional framework where musicians could rehearse and perform the same works over and over again, leading to the concept of a repertoire in instrumental music. In the 1830s, conductor François Antoine Habeneck began rehearsing a selected group of musicians in order to perform the symphonies of Beethoven, which had not been heard of in their entirety in Paris. He developed techniques of rehearsing the strings separately, notating specifics of performance, and other techniques of cuing entrances that were spread across Europe. His rival and friend, Hector Berlioz, would adopt many of these innovations in his touring of Europe. The invention of the piston and rotary valve by Stolzel and Bluhmel, both Silesians, in 1815, was the first in a series of innovations, including the development of modern keywork for the flute by Theobald Boehm and the innovations of Adolphe Sax in the woodwinds. These advances would lead Hector Berlioz to write a landmark book on instrumentation, which was the first systematic treatise on the use of instrumental sound as an expressive element of music. The effect of the invention of valves for the brass was felt almost immediately: Instrument-makers throughout Europe strove together to foster the use of these newly refined instruments and continuing their perfection; and the orchestra was before long enriched by a new family of valved instruments, variously known as tubas, or euphoniums and bombardons, having a chromatic scale and a full sonorous tone of great beauty and immense volume, forming a magnificent bass. This also made possible a more uniform playing of notes or intonation, which would lead to a more and more "smooth" orchestral sound that would peak in the 1950s, with Eugene Ormandy and The Philadelphia Orchestra and the conducting of Herbert von Karajan with The Berlin Philharmonic. At the time of the invention of the valved brass, the pit orchestra of most operetta composers seems to have been fairly modest. An example is Sullivan's use of two flutes, one oboe, two clarinets, one bassoon, two horns, two cornets (a piston), two trombones, drums, and strings. The next major expansion of symphonic practice came, ironically, from Wagner's Bayreuth orchestra, founded to accompany his musical dramas. Wagner’s works for the stage were scored with unprecedented scope and complexity: Indeed, his score to Das Rheingold calls for no less than seven harps. Thus, Wagner envisioned an ever-more-demanding role for the conductor of the theater orchestra, as he elaborated in his influential work, On Conducting. This brought about a revolution in orchestral composition, and set the style for orchestral performance for the next eighty years. Wagner's theories re-examined the importance of tempo, dynamics, bowing of string instruments and the role of principals in the orchestra. Conductors who studied his methods would go on to be influential themselves. As the early twentieth century dawned, symphony orchestras were larger, better-funded, and better-trained than ever before; consequently, composers could compose larger and more ambitious works. With the recording era beginning, the standard of performance reached a pinnacle. In recordings, small errors in a performance could be "fixed," but many older conductors and composers could remember a time when simply "getting through" the music as best as possible was the standard. Combined with the wider audience made possible by recording, this led to a renewed focus on particular conductors and on a high standard of orchestral execution. As sound was added to silent film, the virtuoso orchestra became a key component of the establishment of motion pictures as mass-market entertainment. As orchestras grew in size and composers wrote scores of increasing complexity, the role of the conductor took on greater importance. These conductor/orchestra relationships yielded many historically important partnerships that produced some of the greatest musical achievements in the Western orchestral tradition. The most celebrated of these partnerships have included Herbert von Karajan and Wilhelm Furtwangler with the Berlin Philharmonic, Fritz Reiner with the Chicago Symphony, George Szell with the Cleveland Orchestra, Eugene Ormandy with the Philadelphia Orchestra, Eugen Mravinsky with the Leningrad Philharmonic, Karel Ancerl with the Czech Philharmonic, Arturo Toscanini with the NBC Symphony, Rudolph Kempe with the Dresden Staatskapelle and Gustav Mahler with the Vienna Philharmonic, to name but a few. The late twentieth century saw a crisis of funding and support for orchestras in Europe. 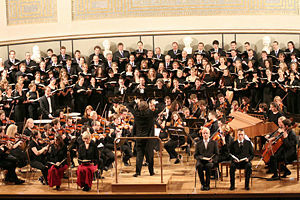 The size and cost of a symphony orchestra, compared to the size of the base of supporters, became an issue that struck at the core of the institution. The drastic falling-off of revenues from recording, tied to no small extent to changes in the recording industry itself, began a period of change that has yet to reach its conclusion. Critics such as Norman Lebrecht were vocal in their diagnosis of the problem as the "jet set conductor" and the problems of orchestral repertory and management, while other music administrators such as Michael Tilson Thomas and Esa-Pekka Salonen argued that new music, new means of presenting it, and a renewed relationship with the community could revitalize the symphony orchestra. In ancient Greece the orchestra was the space between the auditorium and the proscenium (or stage), in which were stationed the chorus and the instrumentalists. This is how the modern orchestra got its name. The Greek word for orchestra means "a dancing place" when literally translated. In some theaters, the orchestra is the area of seats directly in front of the stage (called "primafila" or "platea"); the term more properly applies to the place in a theater, or concert hall set apart for the musicians. This page was last modified on 21 December 2018, at 19:29.